Farming is a constant responsibility, but luckily we get a little time off in the winter when the crops are dormant. It’s the time I look to broaden my awareness of the world, and traveling to countries with intact agricultural societies is my favorite way to do that. 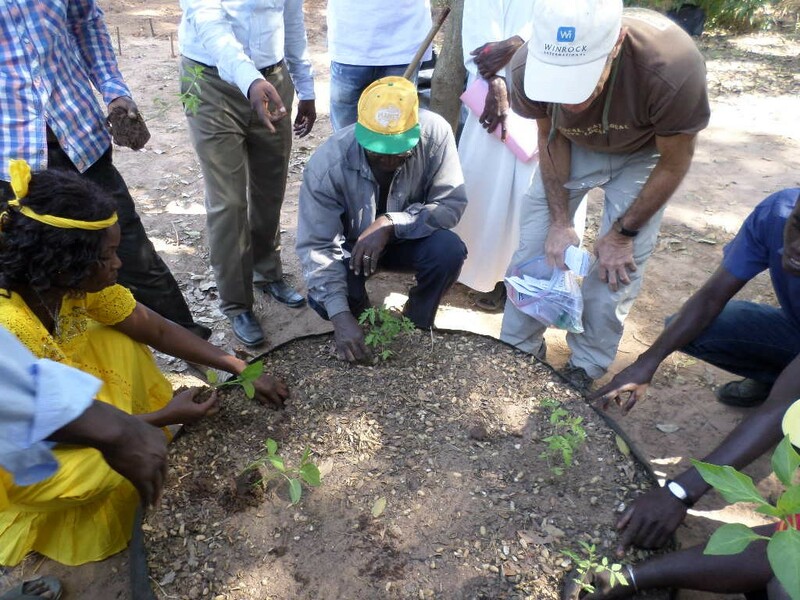 I just returned from my 4th Winrock International/USAID Farmer-to-Farmer (F2F) assignment, this time in southern Senegal, teaching micro-gardening skills to trainers at the Horticulture Initiation Center in Ziguinchor. Micro-gardening is the growing of crops in the smallest of spaces: in recycled containers, or woven poly grain bags, even impromptu raised beds lined with brick and lined with plastic—whatever is available. Micro-gardening was identified some 15 years ago by the FAO as a way to provide access to fresh vegetables to the urban poor and unemployed, an increasing problem with the constant movement to cities from rural farmlands. 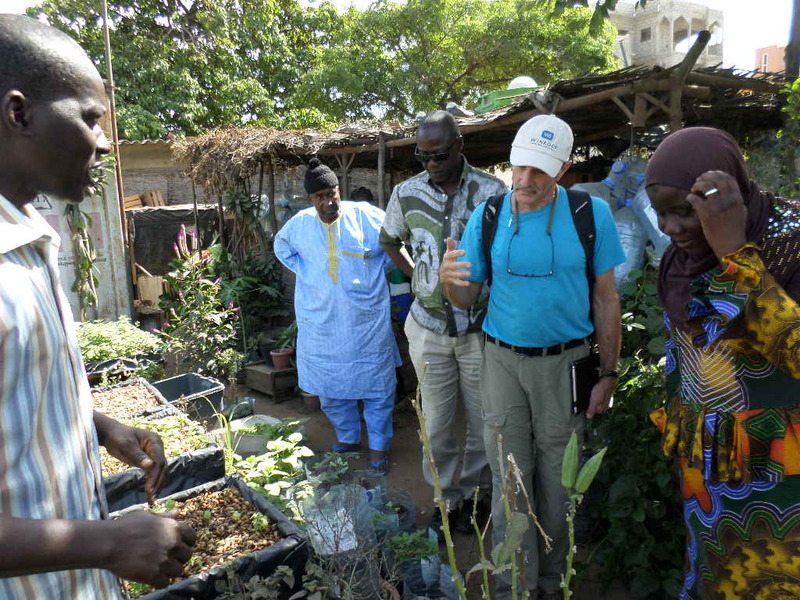 We took a look at the existing projects in Dakar, based on planting tables using peanut hulls and rice hulls as a planting medium, and chemical nutrient solutions as fertilizer. As a certified organic grower, I of course immediately started looking for natural alternatives to the expensive imported fertilizer, and later we found just that: homegrown fertilizer produced using on-site chicken coops and vermicompost. 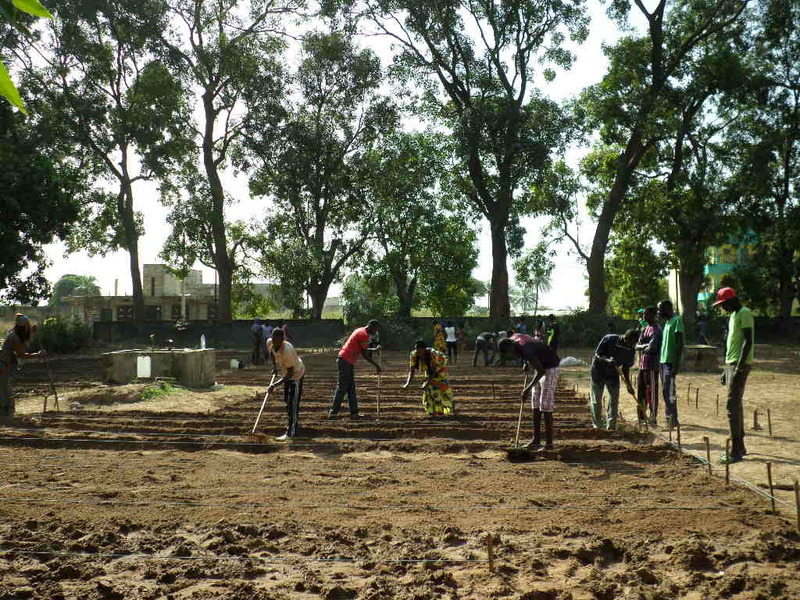 Arriving at the Horticulture Initiation Center in Ziguinchor, I felt immediately in my element, surrounded by beds of lettuce and cabbage, with the students busy each morning as we arrived, watering, shaping and fertilizing beds, planting and weeding. 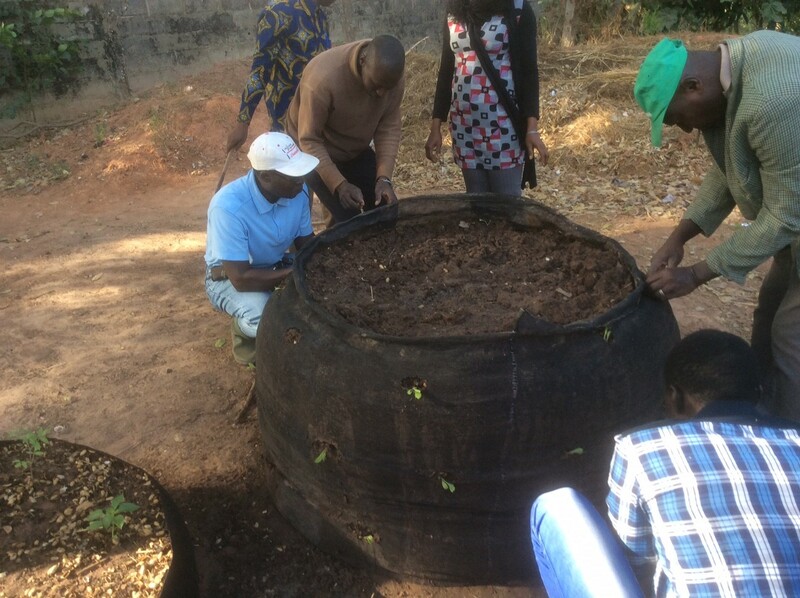 During the four-day session, I introduced both technologies from the States (‘Smart-Pot’ planting containers, seedling plug trays, hand-held seeders) and from Kenya (vertical grow bags and sack gardening); and in the afternoon practicums we adjourned to the garden to plant. 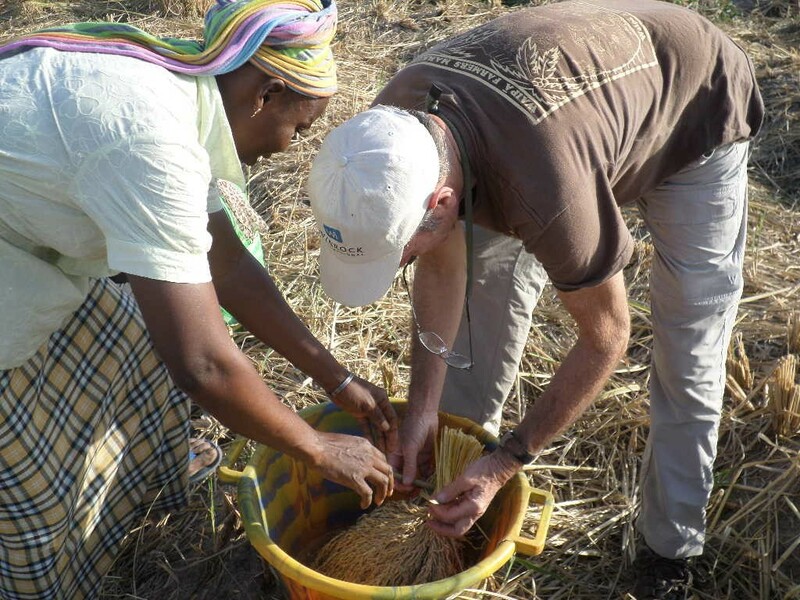 One afternoon, the only woman in class, Amy Diedhiou, invited us to visit her rice field where she was finishing up bundling the rice to carry home and thresh. While in the field visiting with Amy and her sisters, Amy’s husband called on her cell phone and asked to talk to me. He said, “Mark, thank you so much for coming to Senegal. We have a lot of energy, but no means, and we can’t see the way forward. Please think very carefully about this for us.” I spent the rest of the evening pondering this. What are the wisest investments that can help transform these subsistence growers into market producers? The question is pressing, open-ended, and creative…and will not be forgotten. We spent time in class discussing the expansion of micro-gardening to micro-market farming, and the importance of crop choices for maximum profits and tight crop scheduling for year-round marketing. Hopefully, all these topics will be included and expanded on by the trainers in their respective horticultural schools. When farmers meet farmers across oceans of cultural difference, hearts expand and we recognize each other immediately. I can’t think of a better way for an agriculturalist to spend their ‘off-season’ than to meet and share with their global counterparts–everyone is enriched from that meeting.